The most unique trail in America, with landscapes found nowhere else on Earth, the greatest diversity of ecosystems, and over a hundred endangered or threatened species of plants and animals. Hike from white sand beaches along emerald waters to dense blackwater swamps, or trek through the desert-like scrub to then swim in clear springs surrounded by subtropical jungle later that same day. There is no other thru-hike experience like it and it's only possible when every other national scenic trail is covered with ice and snow. "extended trails so located as to provide for maximum outdoor recreation potential and for the conservation and enjoyment of the nationally significant scenic, historic, natural, or cultural qualities of the areas through which such trails may pass." The Florida Trail begins in the remote southern swamps of Big Cypress National Preserve and ends near the Alabama border at Fort Pickens, within the Gulf Islands National Seashore. While its entire official route is 1,500 miles, thru-hikers only traverse about 1,100 miles of it because the trail includes loops and alternate routes that thru-hikers must choose between. Like most of the National Scenic Trails, the Florida Trail is incomplete and a work in progress. There are roughly 60 gaps in the trail corridor which necessitate about 300 miles of connecting road walks. The map to the right shows missing trail segments in red. As far as we can determine, of the 11 national scenic trails only the PCT and the AT are contiguous footpaths through wild spaces from start to finish. In 1969 the Florida Trail Association built the first 26-mile segment of Trail in the Ocala National Forest. The FTA was just three years old, and its founder Jim Kern had conceived of the Trail. 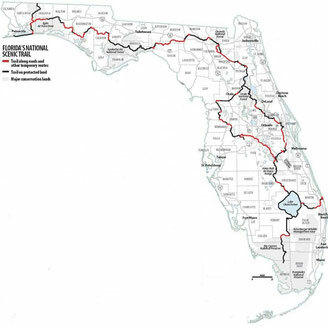 The FTA went on to build 400 miles of trail before 1983 when the US Congress added the Florida Trail to the National Scenic Trails system. After becoming a National Scenic Trail, administration of the Trail was given to the US Forest Service, which also manages the PCT. Florida Trail Association volunteers continued to maintain the trail, build campsites, paint blazes, et cetera, but the trail which they had conceived and created was ultimately out of their control. The FTA continues to promote and maintain the Trail today. Volunteer work crews hit the Trail in November and December of each year to get it ready for thru-hiking season. If you live in Florida, check out our get involved section to learn about joining the FTA and volunteering on the trail. Most Floridians do not know the Trail exists, even those who live close to it. Even fewer actually use the trail. Over the past decade, between 5 and 20 people have thru-hiked the Florida Trail each year (and reported their accomplishment to the Florida Trail Association - the actual numbers are probably slightly higher, perhaps 10 and 40 people annually). Those numbers are astonishingly low considering that 19 million people live in Florida, and that a record 94.7 million people visited Florida in 2013, according to the state's tourism marketing corporation. With at least 100 million people in Florida in any given year, what percentage of them hike the Florida Trail? An estimated 40 thru-hikers are just .0000004%. A generous estimate of 10,000 day and section hikers equals just .0001%. Is the FT Just for Hikers? What about mountain bikes, horses, or pack animals? The FT is just for hikers, sorry. In a few places the FT intersects and briefly overlaps other trails used by equestrians or cyclists but the vast majority of the trail is for foot traffic only. Pack animals are not allowed anywhere on the FT.
One question that people always ask is whether the Florida Trail is just a huge swamp tromp. The answer is no, but the Trail does pass through two swamps. For eight miles it crosses Bradwell Bay Wilderness in the Apalachicola National Forest, a dark tunnel of titi trees rising from beneath black waters. At its southern end, the Trail traverses 40 miles of the Big Cypress swamp, weaving down into and back out of water that is — to the surprise of many — crystal clear. With the right expectations, these swamp tromps can be challenging and fun adventures, analogous to Mahoosuc Notch on the AT. In 2015, the southern United States experienced a very rainy winter, and the Florida Trail was often flooded where it normally would have been dry. Conditions were more similar to those found during the summer wet season rather than the usually dry winter. Meanwhile, the northeast saw record snowfall while California simultaneously experienced a severe drought. These aberrant weather patterns had the same culprit, a mass of warm water circulating in the Pacific nicknamed "the blob." In the past two years, the surface of the Pacific has not given up as much heat to the atmosphere as it once did. Warmer ocean temperatures sent cold wet air across the east and dry hot air across the west. Scientists are reluctant to jump to conclusions and blame the blob on climate change, as good scientists should, but the fact is that ocean temperatures are rising globally. The blob is likely to remain and alter long-term weather patterns well into the future. We suspect Florida will continue to experience wetter-than-usual winters. Florida's peninsula shape and low elevation above sea level make it ground zero for climate change in the US. Already downtown Miami floods at each high tide and saltwater is encroaching on the Everglades. If unseasonable heavy rains continue to fall during the winter months, thru-hikers should expect to have constantly wet feet. Ultimately the Trail may need to be rerouted to avoid areas that remain wet or flooded year-round, both to serve hikers and to prevent erosion and ecosystem degradation.